Razer, the world’s leading lifestyle brand for gamers. 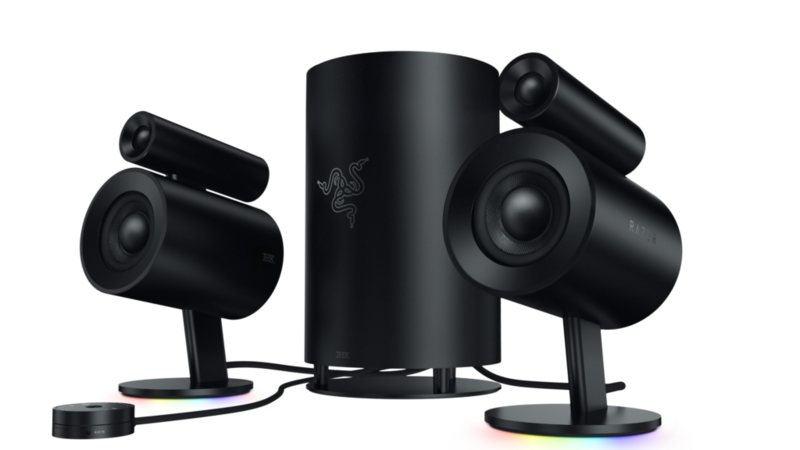 Razer Nommo Pro, a THX certified 2.1 speaker system unveiled at CES is now available for purchase. Features include THX certification, two independent silk dome tweeters mounted atop Dupont™ Kevlar coated speakers with 3-inch drivers and an independent 7-inch cylindrical downward firing subwoofer; desktop dial-shaped control pod for easy access to volume controls and power; audio customization of bass levels, EQ and lighting are handled via Razer Synapse or Nommo Pro app. To deliver premium and immersive PC audio via 2.1 channels that offers true positional awareness, allowing gamers to accurately locate every environmental factor in-game. To provide full-range audio and Dolby virtual sound technology customizable for gaming, movies and music entertainment on PC systems; audio with superior tight, punchy low ends for deliberate, rich and warm sound; individual tweeters that amplify higher frequencies so subtle in-game audio cues are clear; and enhanced immersion.